My take: Charlotte Crawford’s husband of twenty years took her out for a nice dinner and told her he wanted a divorce. If that wasn’t bad enough he also told her there was no one else – he just didn’t want to be married to her anymore. Charlotte’s best friend went through a divorce a year earlier so she knew how hard it would be. When the legal issues were finalized Charlotte had to start living again. She found that being single and dating was a different game than twenty years ago. 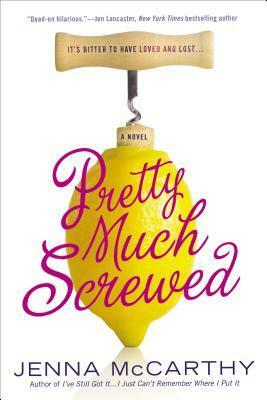 Jenna McCarthy had me laughing as I read about Charlotte navigating 21st century dating via social media, texting, etc. She really met some winners. While I liked a lot of this novel I had difficulty believing some of the decisions Charlotte made. That said, I really liked Charlotte’s best friend Lizzy as well as a certain chef named Jesse. I thought the novel wrapped up a bit too neatly but that aspect, along with McCarthy’s gift for telling an entertaining story, made Pretty Much Screwed a perfect beach read.